Two years ago around spring time I was taking a walk and noticing all the dandelions and wishing I knew more about their beneficial properties, and lo and behold when I got home there was actually an article in my in-box about them. Talk about synchronicity! That started me doing more research and putting this post together, although I never got around to actually finishing it. But with spring just around the corner again, this seems like the perfect time to finally get it done. Growing up I was taught that dandelions were weeds and part of my regular “chores” was to rid the front yard of them before the flowers got all “puff-bally” and turned to seed. After putting this post together, I am thankfully less clue-less 🙂 and amazed by the many uses dandelions have and consider us very fortunate to have them around. Often I’ll pick some leaves for a salad or the bright yellow flowers to add a little color to the room and them later use them in a tea. Did you know you’ve probably pulled, stomped or sprayed a natural superfood that grows in your backyard? 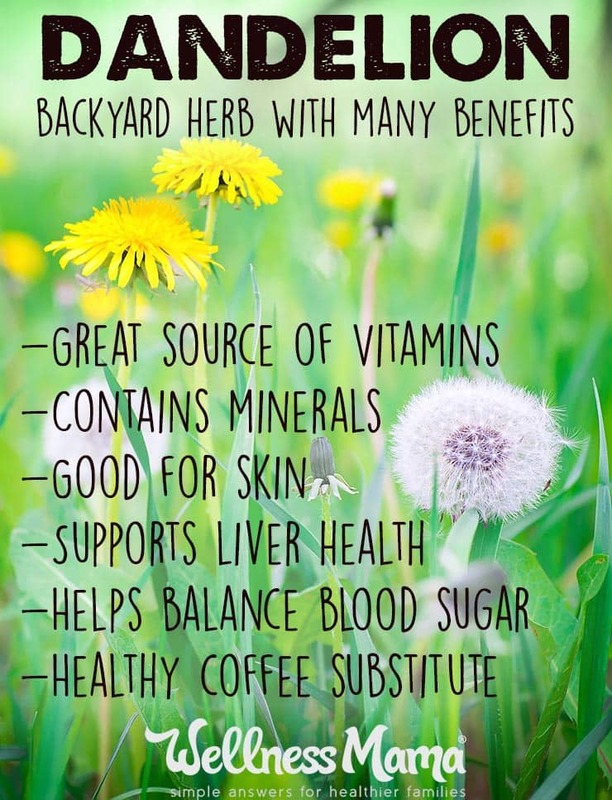 Dandelion is mostly known as a backyard weed, but it has amazing nutrient qualities and health promoting properties. Dandelion is a source of a variety of nutrients and the leaves and root contain Vitamins (like A, C, K and B-vitamins) as well as minerals (including magnesium, zinc, potassium, iron, calcium and choline). The various parts of the plant have a long history of use as an herbal remedy, and every documented population in areas where it grows naturally has used it medicinally. Its common name is a corruption of the French “Dent de Lion” or “lions tooth” – a reference to its jagged, toothlike leaves. My friend and wild food expert, Daniel Vitalis, says that the herbs that our body needs the most tend to grow within a mile of us, just another way that mother earth looks out for her children. To put it simply, dandelions are your liver’s best friend. Yes, your liver, the second largest organ in your body, which among many other duties serves as your body’s filter. If you have been eating “naughtily” and feel as though you have gunkily guk (my own scientific term) built up inside of you, the first course of action is to a) change your diet and b) nurture your liver so that it can process the toxins you’ve ingested and safely remove them from your system. The best liver cleanser I know of is freshly brewed dandelion root tea. And I’m not alone in this theory. Folk healers and doctors were prescribing this long before our time. Another delicious way to promote liver health is to add dandelion greens to salads or sauté them alongside your protein. A so-called “weed” growing right in your front and back yards could hold the key to being the most effective cancer-fighting compound in the world. Previous research, as well as recent research from the University of Windsor in Canada, has found that dandelion root may be especially effective in treating and defeating cancer, and much more so than immune system-destroying chemotherapy. As noted by the university in a press release, researchers are so sure that they have finally developed the correct dosage of the extract, that they are preparing clinical trials using a specially formulated dandelion tea. Research director and biochemist Dr. Siyaram Pandey, Ph.D., of the University of Windsor, along with his fellow researchers, have shown successfully in the lab how the dandelion root extract causes cancer cells to go through apoptosis, or cell suicide, while leaving healthy cells intact. The February 2015 announcement has special meaning for a project that was dedicated to the memory of Kevin Couvillon, who lost a three-year battle with acute myeloid leukemia in November 2010, the university said. The following year, his parents, Dave and Donna Couvillon, made a large contribution to Dr. Pandey’s research on natural extracts and potential cancer treatments. The dandelion root formula in use in the Pandey lab is about five times more concentrated than the extract that can be purchased over the counter and has been proven to kill leukemia, melanoma and pancreatic cancer cells in lab mice. The website Healthy Solutions reported last month that the trials found that cancer cells were destroyed within 48 hours. Clinical trials were opened to 30 patients, all of whom had already exhausted all other cancer treatment options. The dandelion greens contain extremely important vitamins and minerals such as vitamin B6, thiamine, riboflavin, vitamin C, iron, calcium, potassium, folate, magnesium and manganese. They may contribute up to 535% of the suggested daily intake of vitamin K, not to mention over 110% of the recommended daily intake of vitamin A. It is believed that some of its flavonoids such as zeaxanthin and cryptoxanthin have specific healing properties. Zeaxanthin seems to provide protection for the retina when confronted by the sun’s UV rays, while cryptoxanthin can potentially defend the body against the development of mouth and lung cancer cells. For more on dandelion’s cancer-killing properties go here. If you or someone you love frequently suffers from heartburn or indigestion, turn away from PPIs and look to bitter herbs instead. Bitters such as dandelion and chicory stimulate the production of stomach acid and other digestive juices. The bitter flavor of dandelion amps up saliva production, which helps neutralize stomach acid. Dandelion is also anti-inflammatory, meaning it can further soothe heartburn. Herbalists also recommend dandelion as a treatment for arthritis, gout, diabetes, cancer, and liver issues. You can eat the greens raw in a salad, cook the greens and/or the root, blend them in your green smoothie… you can even make a coffee substitute. When using as a tincture, take 10-20 drops of dandelion extract at the start of a meal. These leaf and flower extracts also stimulate glutathione, an important antioxidant used in cell generation. New Research on Dandelions and blood cancer underway….. 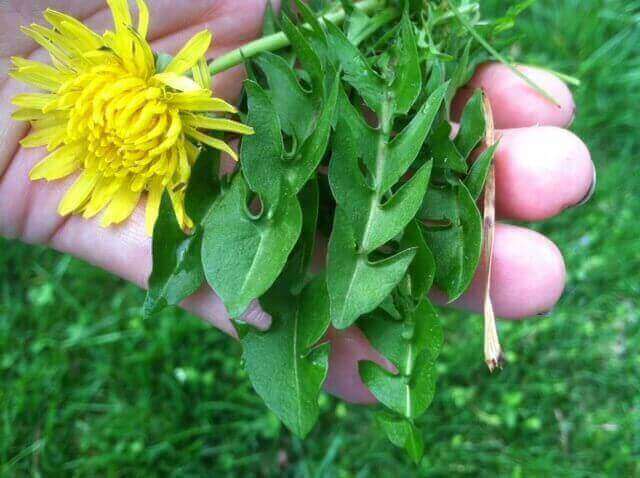 If you’re interested in making your own dandelion tea, here is a great recipe from Natural News Blogs, and here’s some good information about when and how to harvest dandelions that also includes a recipe for making a soup with them. p. s. A friend just told me that dandelion is not only good for your body, it is good for the earth as well. The root system drills through compacted soil, opening channels for rain, aeration, and earthworms; the deep roots bring calcium. I also meant to mention that bees like dandelions and they are an important food source for them, especially at certain times of the year. So having dandelions around is definitely a win-win-win situation! Ever used dandelion? Please share about your experience in the comment section. p.s. Be sure to subscribe to Self-help Health so you don’t miss any future posts. Also check out my website’s To Your Health page and Evolution Made Easier blog for more helpful health tips, tools and information. Wow! Lots of Edible Flowers to enhance your meals! I have so many dandelions growing in the garden during spring summer months. I have tried it. I made indian Pakodas with them last year. Yes, I think many of us enjoy remembering blowing on dandelions and making a wish. We’ve already got some showing around here and I love the bright yellow flowers, although I notice when I pick them and put them in water as a little bouquet, they don’t stay open/last long at all. p. s. Have a fun, relaxing weekend yourself! It’s supposed to be around 70 (wowie!) tomorrow here before it starts heading back to colder temps, so I’m going to get out for sure while it’s nice!